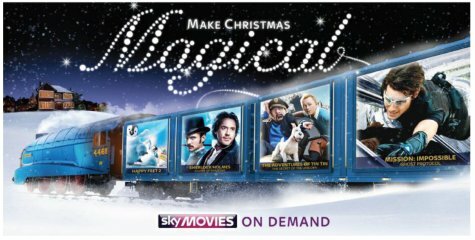 Sky has announced details of its annual Christmas offers designed to tempt people to switch over to Sky in time for the festive season. The headline offer is this: Take out the standard Sky package, and get Sky Movies half-price for 6 months. You can get a free Sky+ recorder, free setup and a Marks and Spencer voucher. If you’re already with Sky, but not yet signed up to Movies or Sport, Sky’s also running a half-price offer… Get 3 months of Sky Sport or Sky Movies half price. Watch live coverage of over 100 sports including Barclays Premier League games and coverage of every live F1 race. Sky offers Entertainment channels as a minimum package, yet the Kids channels are on the Entertainment Extra package, thus more to pay. Offering half price movies has its advantages if already subscribed to the HD channels package. Everything gets complicated when we consider other offers like recommend a friend, instead of a straight shopping vouchers deal to a new customer. Cachback websites and voucher sites also offer us deals and some apply to existing customers wishing to upgrade. Sometimes haggling saves money from the get-go via a phone call to Sky. Sometimes during the 12-month contract or towards the end for renewal or cancellation. I found it difficult to continue with Sky and Sky Multiroom using a Sky+ HD box and a Sky+ box. So I switched to the Virgin Media TiVo 500GB HD box recorder as well as the V+HD player only box instead. It was a compromise, so I lost channels and gained others on their XL TV package including 24 HD channels free. Furthermore, I’m upgraded to the 60MB Broadband speed VM offers. Compromising saved me about £100 a year. I later learnt VM wanted £20 a month extra for Sky Movies 1 and 2, so I declined. There are too many variations offered by these companies and both Sky and VM will increase their prices. I got a 12-month discount on the VM phone line rental, saving about £45 if I paid £120, so that helped reduce prices, for a while, beyond the savings of ebilling instead of paper billing and paying by direct debit saved money as well. As I said, too many variations, terms and conditions, special offers, cashbacks, haggling attempts etc.